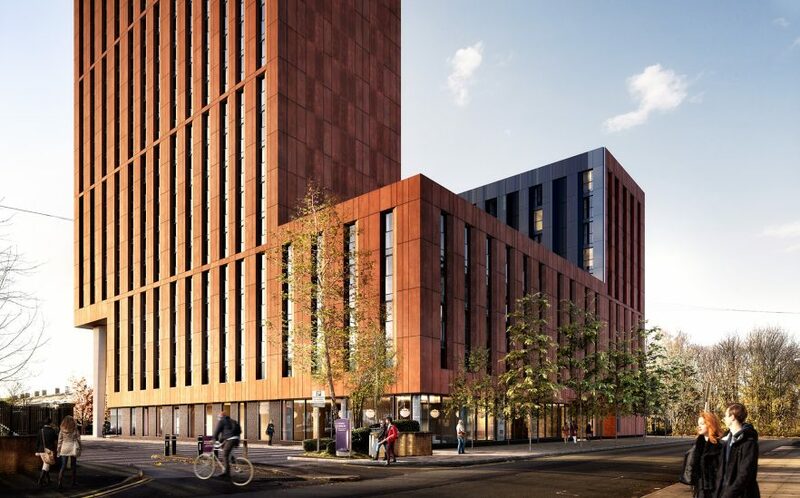 Downing has received planning permission for a landmark luxury student accommodation development which will transform a derelict site at a prominent Manchester city gateway. The company has received the green light for its 807 bed River Street development in a key city centre location, bounded by River Street, Garwood Street, and the elevated Mancunian Way, a stones’ throw from Manchester Science Centre and university campuses. The scheme will see the existing derelict building that has blighted the site for more than ten years torn down and replaced with a visually striking development that will deliver outstanding accommodation for students at the heart of the vibrant new community being formed within the Great Jackson Street regeneration area. Designed by architects SimpsonHaugh, the building’s innovative design is arranged in three distinct blocks forming a U-shape around a roof garden on top of the ground floor. These include a five storey building fronting onto River Street; a 10 storey building fronting onto Garwood Street and River Street; and a 32 storey building running parallel with the boundary of the adjacent hotel. The development will also encompass 1,456sqm of public realm landscape. The building will be clad with a mix of glass and attractive copper-coloured ‘cor-ten’ weathered steel cladding panels. The accommodation will be arranged as studios, clusters and apartments. The building will feature 727 sqm of amenity space, including shared communal and social areas with a TV lounge, games room, cinema and gym, study rooms, presentation and board rooms and relaxation areas. George Tyson, projects director at Downing, said: “We’re delighted to have secured planning permission for this landmark scheme, which will transform a prominent derelict site – creating an attractive landmark at this key city gateway and complementing the regeneration activity taking place within the Great Jackson street area. “Downing is one of the UK’s leading accommodation providers and we are well versed in delivering outstanding schemes in partnership with outstanding architects and the most renowned universities in the UK. Deloitte Real Estate acted as advisors on planning. Downing is one of the United Kingdom’s leading providers of student accommodation. It currently owns and operates over 5,000 student beds across nine different locations including London, Edinburgh and Cambridge. Downing also has a further 4,000 beds in the pipeline across the country.